Quality. Productivity. Cost. All three factor into the decision to implement welding automation. With an eye toward improvement, many companies find that a welding robot can offer the precision and speed needed to gain a competitive edge. They take great care in making the equipment selection, arranging the robotic weld cell and training the proper personnel to oversee it. But what about the welding wire? For many applications, including those in the automotive industry, where materials such as galvanized and aluminized steel are becoming more prevalent due to their high strength-to-weight ratio, metal-cored wire has proven to be a beneficial addition to many robotic-welding operations. It also excels in smaller welding operations and those using standard steel. The benefits are especially true when compared to solid wire, which many consider to be the industry standard. Conversions from solid wire to metal-cored wire can support the push toward greater productivity, in particular, by way of faster travel speeds and higher deposition rates—as much as 20-30 percent more. Metal-cored wire, a tubular filler metal containing metallic powders and alloys, carries higher current densities than solid wire of the same diameter (at equivalent amperage settings), due to its structure. This allows for more weld material to be placed in a joint in less time. Productivity benefits provided by metal-cored wire, however, aren’t just found in the weld cell. This filler metal also provides advantages throughout the pre- and post-weld areas of many welding operations. In any robotic welding cell, repeatability is key. The robot must produce the same weld over and over—and quickly—to provide the best quality in the shortest amount of time. Whether it’s in today’s automotive applications, driving toward lighter, thinner, stronger materials that can meet upcoming fuel requirements, or in a shop producing lower-volume parts, accuracy is non-negotiable. When paired with metal-cored wire, robotic welding can offer key benefits directly in the weld cell, namely, a broad arc that can bridge gaps and provide a smooth weld-bead appearance; arc stability and minimal weld-pool turbulence, resulting in better deposition efficiency; and consistent arc starting and wire feeding for high weld quality. While metal-cored wire excels with a standard spray-transfer process for materials thicker than 1⁄16 in., when welding thinner parts, such as automotive engine cradles or frames, pairing this filler metal with a modified short-circuit process is necessary. This combination provides the best quality and travel speeds on flat and horizontal welding positions. It also minimizes subsurface porosity that may occur when welding materials such as galvanized steel, and helps lower heat input to reduce the risk of burnthrough. The productivity benefits provided by metal-cored wire aren’t just found in the robotic-welding cell. This filler metal also provides advantages throughout the pre- and post-weld areas of many welding operations. When welding with metal-cored wires in out-of-position applications, pulsed-welding programs are necessary to control the fluidity of the weld pool. Consult with a trusted filler-metal manufacturer or welding distributor for options, as certain American Welding Society classifications of metal-cored wire perform better in these applications than others. Metal-cored wire paired with a pulsing program offers benefits when welding in-position, too, particularly with robots offering seam-tracking capabilities. The pulsing action shortens the arc, making the weld puddle more manageable and lowering heat input into the part. Consider packaging and wire diameter when implementing metal-cored wire into a robotic-welding application. Look for payout drums that feed the wire with the appropriate cast so that it feeds smoothly and makes a consistent connection with the contact tip to provide the best arc-starting. Depending on material thickness, wire diameter can be increased, which allows the robot to place a greater amount of weld metal into the joint in a shorter period of time. Using a heavy-duty contact tip, such as a chrome-zirconium, helps ensure top performance from metal-cored wire. These tips better withstand the high volume of wire passing through for longer periods of time than standard-duty contact tips. That means less downtime for changeovers, which helps support the greater productivity sought with metal-cored wire when paired with a robot. 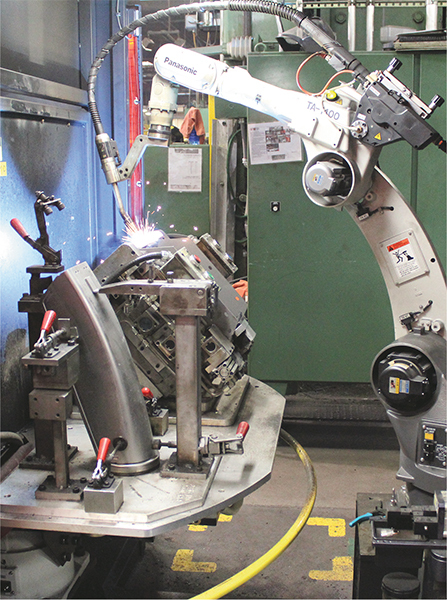 In robotic-welding operations—regardless of the industry—many activities occur in the pre- and post-weld areas. These range from pre-cleaning of the base material and applying antispatter before welding to removing spatter and powder-coating parts after. In many cases, metal-cored wire can eliminate some of these steps. Activities such as tacking parts or loading fixtures, of course, are simply non-negotiable in the pre-weld area. To obtain the best quality, these must be addressed appropriately. Because metal-cored wire has added deoxidizers, alloys and arc stabilizers, however, it generates very little to no spatter and can weld through some contaminants. These advantages reduce the time and cost for antispatter application, as well as the time needed to clean spatter from fixtures, flooring and the robot. It also minimizes the amount of post-weld grinding and sandblasting. By removing such pre-weld activities, companies operating robotic-welding systems can then reduce the associated time, labor and costs in this area of the welding operation and send parts straight to the weld cell. In the post-weld area of a robotic-welding operation, metal-cored wire offers some of its best advantages—namely, it can reduce cleanup and rework. Because metal-cored wire offers good gap bridging and a smooth weld bead, and reduces instances of burnthrough, weld quality typically is quite high when coming out of the robotic-welding cell, with less need for rework. By eliminating these activities, companies can increase the flow of completed parts to other stages of production, such as painting or coating, to improve overall productivity. Also possible: lower labor costs and faster return on investment by reallocating labor elsewhere in the welding operation to gain even higher productivity levels. See also: Hobart Brothers Co.